Do you have part-time workers who could benefit from TUITION FREE soft skills -training? Do you have applicants for open positions that need to be a little more well-rounded in their communication or their interpersonal or problem solving skills? WorkReadyNH can give your current and potential employees the soft skills that can improve your bottom line. WorkReadyNH is an intensive 60-hour professional development course that enables participants to learn or develop “soft skills” and “hard skills.” WorkReadyNH empowers participants to effectively articulate how their skills align with your goals. WorkReadyNH also teaches participants how to better use personal strengths, showcase their skills, understand your expectations, develop stronger communication skills, and grasp the critical elements of customer service. After successful completion of the WorkKeys Exam, a participant can obtain a National Career Readiness Certificate from ACT. The National Career Readiness Certificate is a portable, evidence-based credential that certifies essential hard skills needed for workplace success in the topics of Work Place Documents, Graphic Literacy and Applied Math. This credential is registered with ACT in the National Career Readiness Certificate database and may be verified by employers with participant’s permission. 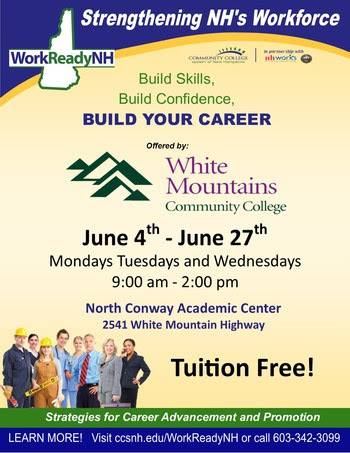 WorkReadyNH will be hosting a session at our WMCC North Conway Academic Center at 2541 White Mountain Highway. Classes run from June 4th to June 27th, Mondays, Tuesdays and Wednesdays 9am to 2pm. See attached flyer, Spread the Word! If you have people in mind who have the potential to be star employees, have them call me at 342-3099 or email me at echampagne@ccsnh.edu. They can also visit our website http://www.wmcc.edu/workreadynh for more information. WorkReadyNH Participants must be NH Residents, at least 18 years old and have a sixth grade reading level. Would you be interested in being a guest speaker for our class? We would love to have you spend some time with our participants. They would appreciate knowing more about your company and what it is you are looking for in an outstanding employee.